The police representatives provided the EUAM delegation with a comprehensive briefing on the current crime situation and shared their views of the ongoing police reform. They pointed out that Vinnytsia is in the central part of Ukraine, but simultaneously it has a state border. This is why the smuggling of alcohol and narcotics are currently real problems at the border. In order to fight the smuggling, the police, security service, customs and border guard are cooperating. In addition, public order maintenance during mass events is one of the major tasks which binds police resources. Another important point on the busy EUAM agenda was establish working relations and to get an overview of the expectations and state of play in the oblast from the civilian administration and political representatives. The local representatives mentioned decentralization as the key issue but also pointed out: “Vinnytsia is the most European oriented oblast in Ukraine.” Expectations towards reforms are high, especially regarding constitutional reform and decentralization of the public administration. 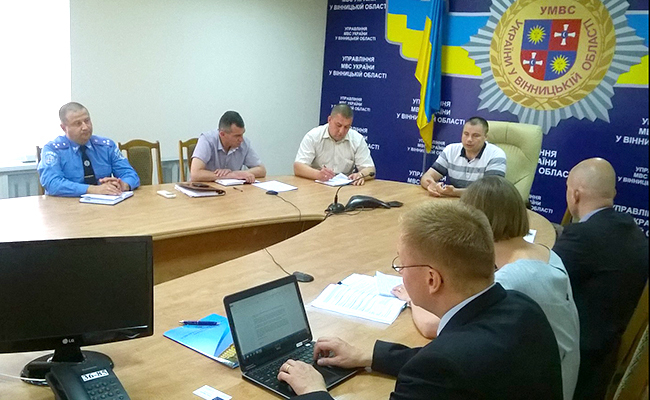 The EUAM also met with the local civil network “OPORA” headed by Regional Coordinator Natalia Velychko to get an overview of the civil society’s perception of the Security Sector Reform actors.